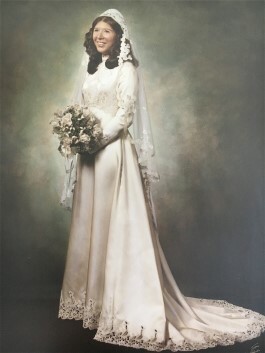 This wedding dress was my mother’s wedding dress (1977), and her sister wore it to her wedding too (in 1983 after some additional alterations). 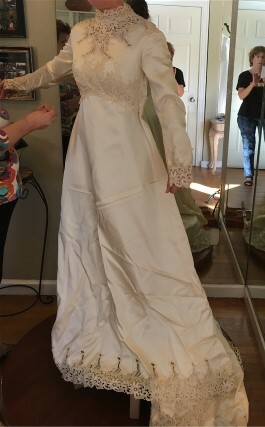 My mom had the gown preserved afterwards, and we pulled it out one day after I was engaged to try on for fun. Maura’s mother and aunt wore this dress in 1977 and 1983. Click on photo for larger version. At that time I didn’t know what style I wanted, and she was the one who came up with the idea to alter it to my liking. I was hesitant at first since the original gown had a beauty and class of its own and cutting or changing its style seems like a sin. But after trying on other gowns and not loving any, I decided to go for it. So my mom and I worked with our local seamstress for two months to create the dress it is today. The biggest challenge in the process was getting the old lace on the bodice to make sense after I removed the high neck. To do this I decided to work with the seamstress to add the extra lace removed from the neck and sleeves to cover the entire bodice. If you look closely at the photos you can see this evolution. Maura’s vintage wedding gown before transformations. Click on photo to see enlarged. Maura’s vintage wedding gown after removing bodice lace and sleeves. Click on photo to see enlarged. 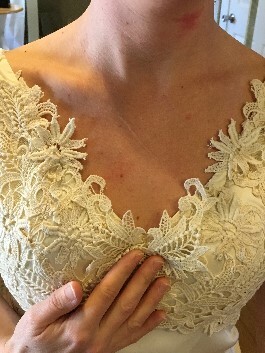 Laura’s wedding dress after altering neckline. 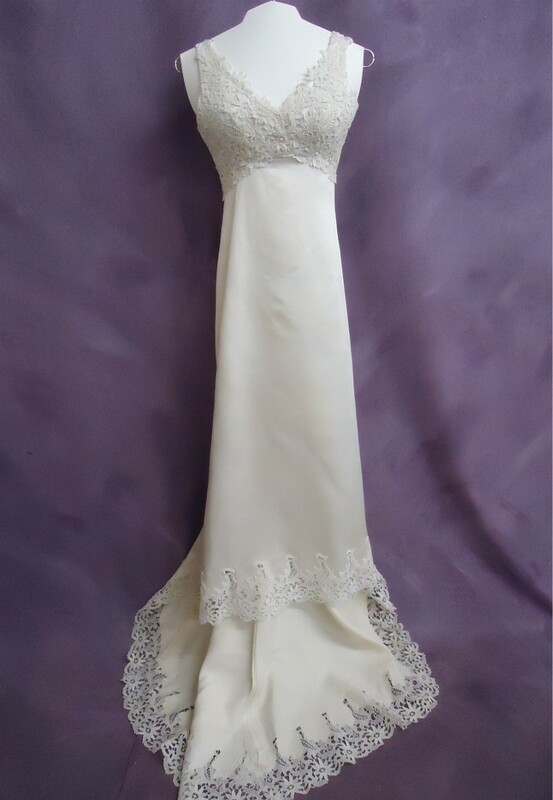 Laura’s wedding dress with added lace at neckline. Last summer my fiancé and I had planned a small “surprise” wedding with our families in Yachats, Oregon. Sadly due to a life threatening injury to our nephew two days before our wedding, we had to postpone things. My fiancé and I were devastated and didn’t know what to do as we watched our nephew fight for his life. 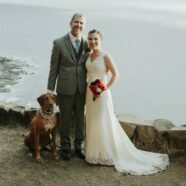 Eventually we decided that we just wanted to be married, and last September I got to wear my wedding dress in a small ceremony overlooking the ocean with 3 close friends and dogs to be our witnesses (see photos). In the rush of things I never was able to get the dress cleaned since my mom had it preserved. 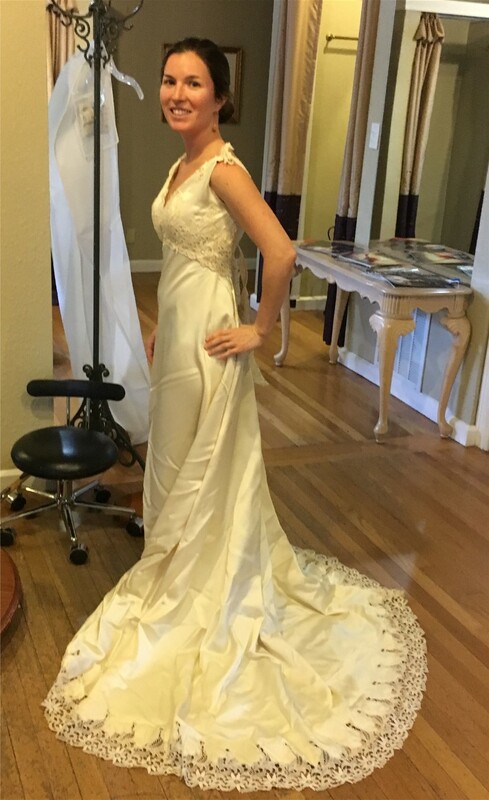 I was nervous about sending it to any old dry-cleaner, and was thankful when I found out about Heritage Gown online. 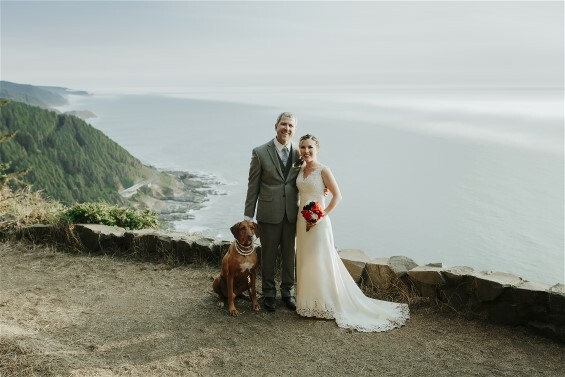 To make it up to our friends and family who weren’t able to celebrate with us last year, we have planned a “wedded” ceremony this July on the Oregon Coast. I want to thank you all for your help cleaning my dress of some stains it acquired last September and over the years of being in storage. After everything our family has gone through I am looking forward to celebrating with our friends and family and getting to wear my dress again so my mom can see the finished product! Maura wearing her heirloom wedding dress and new husband. Maura’s heirloom wedding dress after wedding dress cleaning by HGP. Click on image to enlarge. 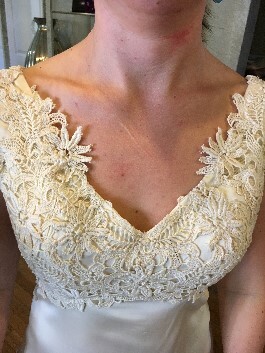 Maura’s vintage ivory synthetic satin wedding dress with crochet lace had a very dirty hemline and stain on the right side. There were oxidation spots in the lace of the bodice, underarms and in the lace of the hem. There is a section of the lace hem that was torn and another section with an unfinished raw edge. We did not do a full restoration on Maura’s gown but we were able to get the majority of the dirt and orange spots out of the dress with regular wedding dress cleaning. There are a few residual dirt spots in the lace of the hem that had penetrated deeply. The dress did lighten some with the wedding dress cleaning. Get a Free Quote for your Wedding Dress Cleaning and let HGP create a heirloom for you.